Post some pix of the best crab pot (recreational) design you know or use. 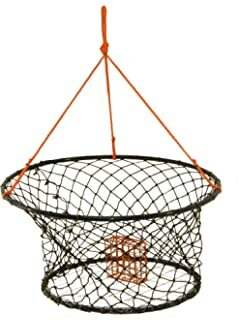 It's not pix, but the June 2017 Newsletter from John's Sporting Goods described what they consider a good crab pot. They preferred round or octogon pots to folding, as the folding have limited life and crab can more easily exit the pot. Some of the features they liked were "ramp style entrances that make it difficult for a crab to leave" and entrance doors "at least 9 to 10 inches wide. Think about this: if the entrance doors restrict the crab size entering the crab pot, the doors are basically sorting out the size of crab entering your pot." They also recommend using a magnum buoy as they are equal to three of the standard size and are less likely to be pulled underwater when the tide comes in. Stow-B-Low. Hands down the best. Terrific unit. A slight thread drift...Seems the opinions are for the west coast. Any suggestions for crabbing equipment on the east coast? Styles, makes etc. Thanks in advance. This is Picture 1 what is normally used in South Louisiana. They do take up lots of storage space, "occasional" crabbers will sometimes just tie a bait onto a string and pull them out that way or in a bucket type net on a cord. Picture two is a couple of crabs I caught "going at it" I guess one last fling before things got really hot in the boiling pot. By the way in Louisiana they are crab traps, if you ask for a crab pot you will probably get something to boil them in. Tim, thanks for that link, good stuff. Ka, I will check out trilogy. Capt., likewise Stow b lo. A length of string, a chicken neck and a net to pick the crab off the neck. As a kid on a good day we could get over 50 blue crabs. The crab pot at LFS only has two doors. You should be able to have four large doors for easier entry. This 30" SMI Octagon crab pot has four 11.5" doors and a fine mesh bait box. Looks like I will be headed to Everett tomorrow. I'm hoping to get a couple of those and a Scotty 2500 puller if I close later this month. That is what I use. Still helps to have really good bait, and above all, be in the right place. I'm with Bigsfish. Use anything but these and you miss out on all the fun. Grew up on the Chesapeake. Some habits (and memories) die hard!! You get it. Lots of fun, cheap, and lots of crabs for a few people to eat. I like rings when I have the kids. Makes it more active than a multi hour soak. Messrs. fb and Bf. Oh, I get it too. Been there, done that and it IS great for the kids but I'd much rather soak and eat.